As part of the annual OIT Classroom maintenance program, the mediation of several classrooms was upgraded over the summer. This year we have refreshed the technologies in the following rooms that includes a new video projector, document camera, control system and computer: CLP 223, CLP 225, STT 5113, OHA 306, ROC 107, LSC 565, MGH 463, STT 311, STT 312, and STT 313. Additional facilities are scheduled to be updated at the end of the fall term. A new annotator and display were installed in BRN 101L, a camera and microphone have been installed in MGH 461, and minor improvements were completed in MGH 017. Lecture capture capabilities (Panopto) have been added to AMH 211, AMH 212, LSC 334 and LSC 433. For detailed information and instructions on Panopto, please visit www.scranton.edu/panopto. Please note that Mediasite has been retired from use and is no longer available in the LSC facilities. Our classroom database has been upgraded and contains details and instructions for each of the mediated spaces. 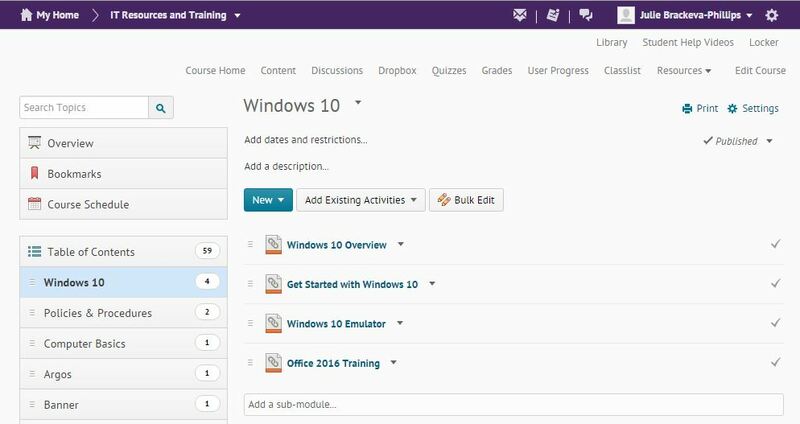 A link for the classroom database can be found on the www.scranton.edu/techsupport website. The classroom database is only accessible while on campus. During the first week of classes we will stage an Instructional Technologist at both ends of campus to facilitate quick customer support. Faculty can obtain assistance for any of our mediated facilities by contacting the Technology Support Center at 570-941-HELP. Many device updates were completed in the computer labs: Aquinas (9 new PC’s); Biology (2 new PC’s, 5 Mac system enhancements); Chemistry (8 new PC’s); Communication (15 new Macs); Classroom systems (28 new instructor’s PC’s); Education (15 new Macs); Library (15 new loaner laptops); Nursing (1 new laptop); Physics (23 system enhancements; 6 new PC’s) and Psychology (13 new lab laptops). All lab and classroom Windows computers have been updated to include Office 2016 replacing Office 2013. Many software applications have been upgraded in our computer lab facilities including SPSS, Eviews, MatLab, and Maple. All lab and classroom systems received operating system and third party application updates. Several new systems were also put in place. As we expand our virtual desktop program, we are pleased to provide faculty with the ability to utilize a virtual lab. The virtual lab provide access to virtual Windows 7 machines preinstalled with University licensed software from a personal device eliminating the need to use rooms with lab machines when University licensed software is needed. Students can utilize their own laptops to access standard applications allowing faculty to create a lab in any room that they are teaching in. 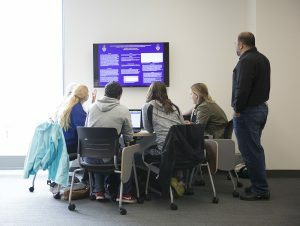 More information about virtual labs can be found at http://www.scranton.edu/pir/its/virtual-labs.shtml. Over the summer months, the desktop windows operating system and many of third party applications (Firefox, Flash, Java, Adobe, etc.) received security patches through KBOX or Windows update. If you have not used your computer over the summer, these updates will automatically begin to download to your system when you turn it on. As the critical patches are installed, machines may experience a temporary decline in performance. IT Services advises faculty to take this into consideration and allow time for the updates to take place. MS Office 2016 is now available for faculty to install on University owned office computers. IT Services is offering Microsoft Office 2016 / Project 2016 to PC users as a self-service option through Microsoft’s System Center Configuration Manager (SCCM). Printable instructions for accessing the Software Center and installing Microsoft Office Professional Plus 2016 and Microsoft Project Professional 2016 are available. Please note that these packages are only available for installation on University owned, Windows 7 or higher computers and that they will replace previous installation of Microsoft Office and Microsoft Project (e.g., Microsoft Office Professional Plus 2013/Microsoft Project Professional 2013). Faculty who desire to have IT staff install the MS Office 2016 / Project 2016 for them, can contact the TSC. Also, if you use Word or Outlook customizations such as macros, autotext entries or styles, please be advised that these customizations will not load after upgrading to MS Office 2016. IT Services is beginning to work on faculty office system replacements. Full-time faculty primary systems are now scheduled for replacement every four years. Faculty who are scheduled to receive computers in FY16-17 year will be contacted in the coming weeks to verify device configuration. 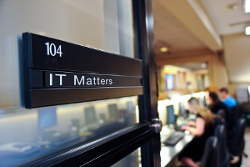 IT Services offers a variety of one-on-one and group training sessions to faculty and staff. Contact us today to brush up on your computer skills or to get hands-on training for the most commonly used campus applications such as CMS, Microsoft Office and more. In addition to standard training classes, we are happy to announce the following Fall IT sessions. These topics have been selected from technology conversations with members of our campus. Grab a colleague and make sure to join us for any or all of our sessions. Each session is approximately an hour long. September 15, 2 p.m. to 3 p.m. in AMH 103: Use mail merge to send personalized emails messages to your email list (Microsoft Office). Maximum of 6 registrants. September 20, 9 a.m. to 10 a.m. in AMH 103: Basic Computing: The purpose of this basic computer tutorial is to help the reader better understand how to use their computer more effectively. This session will include: What files and file types are, where are my files stored, how to copy files, zooming in and out, internet browsers, using menus and toolbars, copy and paste text in Word, and more. October 13, 10 a.m. to 11 a.m. in AMH 103: Use mail merge to send personalized emails messages to your email list (Microsoft Office). Maximum of 6 registrants. Register for these sessions online today as spaces are limited. For questions, email julie.brackeva-phillips@scranton.edu. Posted in IT News, IT Training and tagged Fall 2016, Sessions, Training. Bookmark the permalink. Partnerships among University departments can accomplish complex and far-reaching tasks more effectively than when these are acting alone. Working together to improve processes that help to develop solutions together, can generate good ideas with results that might not otherwise manifest. It also lends itself to creating an environment where departments can gather their resources to more effectively research new product and process implementations, or to leverage and negotiate prices and terms from vendors. How do we collaborate with IT? One of the main areas that IT can help is in the vetting and implementation of Cloud Computing Services and third party products. There are policies and guidelines for the Use of Cloud Computing Services. There are security and Banner/ERP integration implications that need to be considered. IT also works closely with General Counsel for contract reviews. By pulling together IT resources and the functional user experts, we can ensure that we are getting the best product for the University. Individuals can email techsupport@scranton.edu with project details. The Technology Support Center will review the submission and submit the request to the appropriate IT office. What IT projects are groups currently collaborating on? Currently, we are looking at both a RoyalDrive and a Footprints replacement. Teams for both of these projects consist of faculty and staff, to test and help with the implementation of the different products. Another area that IT has decided to collaborate with outside offices is the Windows 10 pilot, because it has allowed for more testing by a variety of members in our community to make the deployment more successful and streamlined for our customers. By creating a collaborative team, we can gather necessary experts to help a project succeed. By doing so, we can more effectively influence vendors, analyze system compatibility and plan implementations. By gathering our efforts, we reduce duplication and issues, and concentrate on a more proactive approach that provides multiple voices for troubleshooting and problem solving during the implementation process, rather than once the project is completed. Even if collaboration might require additional planning and perhaps a longer implementation process, the benefits are far greater and promote a shared vision and common goals. Posted in IT News and tagged Collaboration. Bookmark the permalink. Desire2Learn (D2L) is the University’s learning management system. This online system is almost exclusively used by faculty to enhance their classroom instruction by sharing course related materials, online quizzes and to collect assignments. IT Services is currently developing an IT Resources and Training course in D2L that will gather instructions and resources concerning campus technologies. Once completed, it will be made available to all faculty and staff. This platform is ideal because of its versatility. It allows us to reference online articles, gather documents and videos all in one central location. Although D2L is easy to navigate, we will be offering training during late Fall. Posted in Computer Tools, IT News, Sneak Peek and tagged D2L, IT, Resources, Training. Bookmark the permalink. All staff and faculty are encouraged to complete the yearly online SANS Computer Security training. This important training will assist all computer users on campus to understand how we can be the target of identity thieves or other malicious actors. If your employment at the University requires you to have access to personal identifiable information, or you need to process credit card payments over the phone or online, you are required to complete specific training sessions in SANS. • Each video is only 3-5 minutes in length. • You can view them in any order, at any time. • Each video focuses on what you NEED to know. • It’s critical that you know how to keep data safe in the work place. These training sessions count toward your professional development pillar on your wellness activity log. If you complete the full training series and the short quizzes at the end of each video, you will have earned 10 points! 3. Your username is your “firstname.lastname@scranton.edu” email address. If you don’t know your password, you can reset it by clicking the Forgot your Password link on the SANS Training Center website. Need SANS account help? If you don’t know your password, you can reset it by clicking the Forgot your Password link on the SANS Training Center website. If you have any other questions, contact the Technology Support Center at 570-941-HELP (4357) or email techsupport@scranton.edu. Posted in Computer Tools, IT News and tagged SANS, Security. Bookmark the permalink. 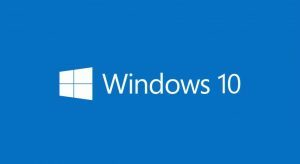 IT Services launched its Windows 10 Early Adopter Program on June 3, 2016 to test the feasibility of offering a minimally disruptive, self-service option to upgrade existing Windows 7 computers to Windows 10. We are grateful to the 19 faculty and staff members that participated in the program whose feedback helped us to identify items to improve upon. Although all the participants were able to successfully complete their upgrade, we have decided that the campus release of the self-service upgrade from Windows 7 to Windows 10 will require additional fine-tuning. We will be forming an additional select group of early adopters to help us improve the process even more. Even though the self-service upgrade from Windows 7 to Windows 10 is delayed, IT Services will be delivering and setting up all new PC systems with Windows 10 pre-installed on them. If you would like Windows 10 training, please contact Julie Brackeva-Phillips at julie.brackeva-phillips@scranton.edu. Posted in Computer Tools and tagged Windows 10. Bookmark the permalink.